Iceland awaits for the explorer inside all of us. Channel your inner Lewis & Clark or your Hiram Bingham and get ready for the adventure of a lifetime. Over a hundred volcanos dot the landscape. Monstrous glaciers. Lava flows as far as the eye can see. Bubbling hot springs. Steam vents shooting forth sulphur based gases that remind you of the worst rotten eggs you have ever smelt in your life. Geyser's launching high into the air. Apocalyptic scenes beyond your wildest imagination. That is Iceland my friends. For thirteen days I circled the entire island. I saw spectacular waterfalls around almost every bend. Blasting geysers. Geothermal fields that looked like something from the end of times with hissing steam vents and bubbling hot pools of mineral water. Glaciers that looked like tidal waves of ice careening down high valleys. Oh and did I mention wildlife? The island doesn't have a wide diversity of wildlife, but what it has will wow you. The most beautiful horses on the planet. 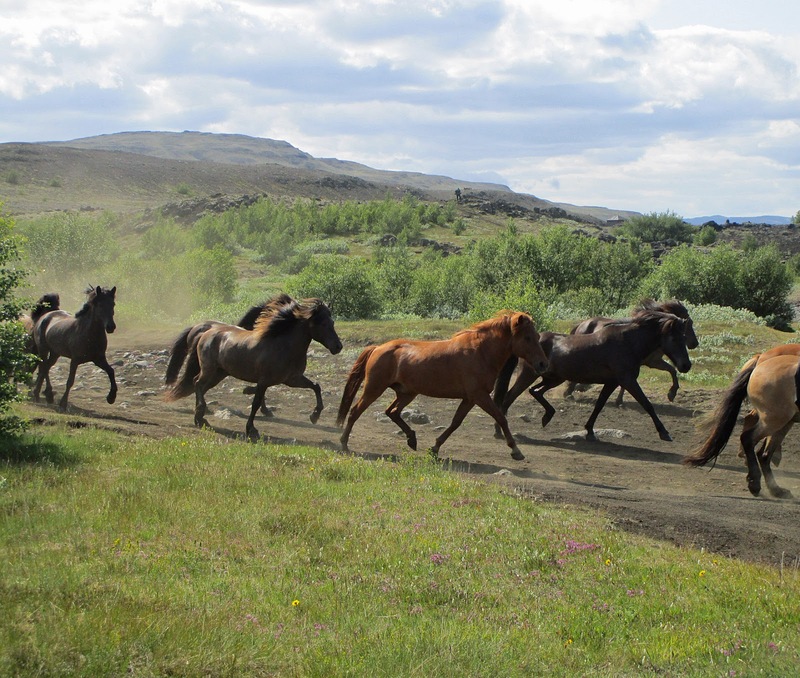 That is saying something coming from someone living in the heart of cutting horse country, but the Icelandic horses are something special. 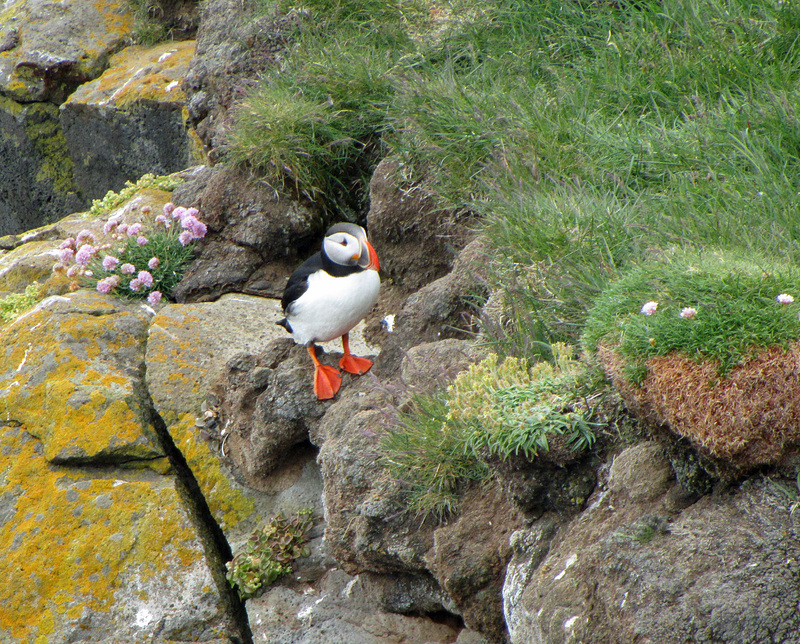 The ever famous and ever so cute puffin at the Latrabjarg cliffs in the Westfjords. Latrabjarg is not easy to get to. Solid three hour round trip drive on narrow winding dirt roads. Beautiful scenery though as you travel along fjords and up on over mountains. But a real treat awaits. 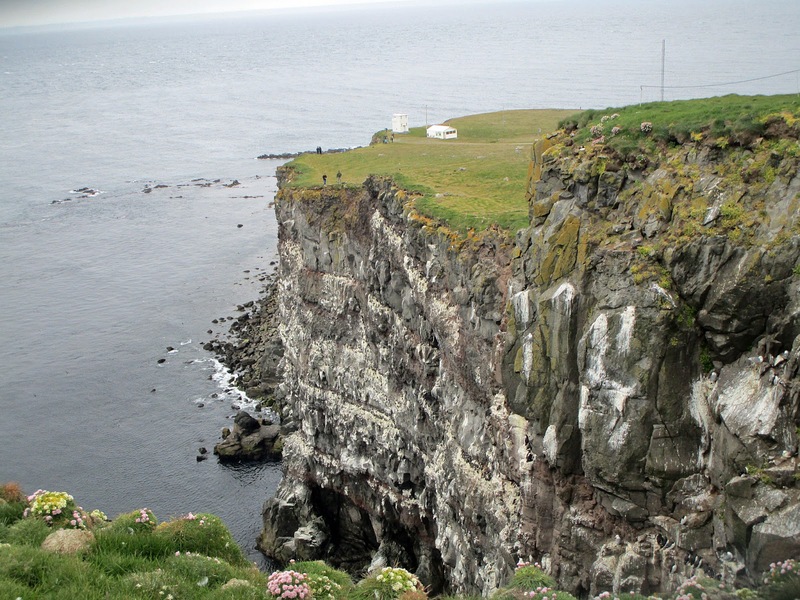 A colony of unique puffins dot the high cliffs. 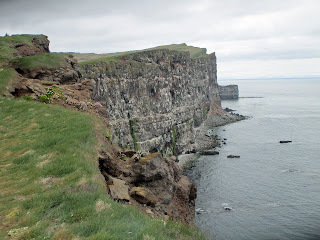 And I mean high cliffs. Latrabjarg are the highest coastal cliffs in all of Iceland and they are all yours to explore. A little bit dangerous if you are not careful. There are no ropes or safety features at all. You can go right to the edge of the cliffs that tower close to a thousand feet. In fact a German tourist had fallen only three months prior and lost his life right there! 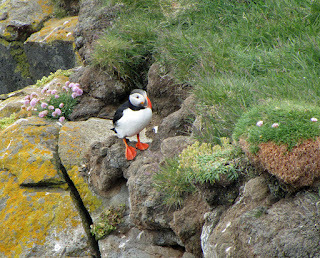 But if you watch your step you will get wonderful pictures of these puffin. They'll sit right there and allow you to click away to your hearts content. Iceland also has a huge population of swans that summer there. We didn't see any swans until near the end of our trip around the island. It seems they mostly hang out in the southeast and southern parts of the island, but once there, more beautiful white swans than I could ever thought have existed were waiting. I had heard and read about the famous horses of Iceland. Wild. Strong. Hearty with their long manes. I must admit they are something else. I am from cutting horse country and we have more than our fair share of beautiful horses, but they simply do not compare to the powerful horses of Iceland. Just look at these beauties. A wildflower very similar to our Texas bluebonnet, but twice as big and twice as beautiful. Oh and how about the cutest little arctic fox you have ever seen? The final day of our trip we took a tour inside of a volcano. Literally! A huge crane lowered us through about a ten foot by ten foot opening at the top of a magma chamber down into the old volcano. The magma chamber was so large you could fit the entire Statue of Liberty inside! But outside was the cutest little arctic fox you have ever seen. He wasn't really afraid of us. He darted around and of course stopped to pose for us a couple of times. We always want a simple answer to everything to make it all make sense. I don't know. Iceland is just constantly surprising. How can all this exist in one place? On one single island? Iceland is magnificent. I never thought I would find a place more enchanting than Peru, but I must admit Iceland blows Peru away. The ice flows in southern Iceland are not to be missed, amazing! Plan your trip to the ice flows when the tide starts coming in to the bay. Fish come in with the tide followed by lots of birds and seals. The massive icebergs crash into each other. Very spectacular.